After 9 months of waiting, Samsung’s newest flagship phone has been officially announced in New York’s Times Square, and as thousands tune in, the latest batch of hardware and software features are released. Dual Camera - Use both the front and back camera at the same time, so that you can capture an event and your own reaction to it. Group Play - Allows multiple Galaxy devices to link together to play games over Wi-fi. Smart Scroll - Scroll by tilting your phone forwards and backwards. Smart Pause - Pause/resume a video if your eyes look away from the screen. S Health - Gathers health information, such as sleep patterns, heart rate, blood sugar/pressure, compiled via accessories. Your phone can also make reports for you. S Voice Drive - Use your phone while driving (using voice), as long as your car has Bluetooth. It’ll also tell you messages, use voice-to-text to respond, and give directions. HomeSync - A home server for Samsung devices, which syncs your photos. You get 1 TB of storage with up-to 8 user support. Story Album - Sorts photos into albums depending on location. Samsung Knox - Separates your phone into 2 sections - Work and personal. the work profile can be wiped by your IT administrator to protect sensitive information. Sounds quite similar to BlackBerry 10. Adapt Display - Adjusts saturation, contrast, and brightness depending on the surrounding conditions. S Translator - A built in translator which works for 9 languages (hopefully more later). Eraser - Allows you to erase parts of an image. Drama Shot - 100 photos in 4 seconds, then puts it all in one image. Sound & Shot - Record sound while taking a photo. The sound plays back when you view the image. 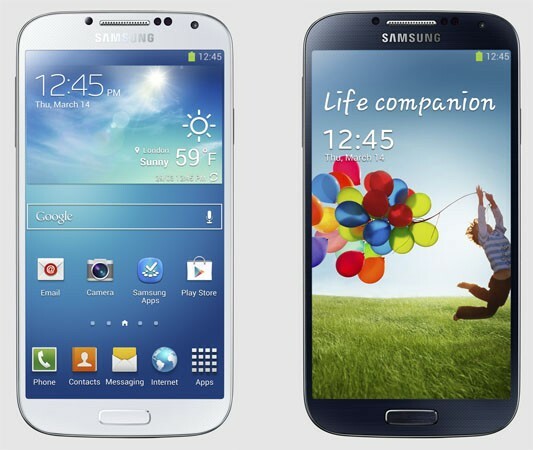 The Galaxy S 4 is slated for a late-April release depending on your location. In Canada, we are expecting a mid-May release. Co-written with Vincent Hung, Timothy Mui, and Joseph Wong.